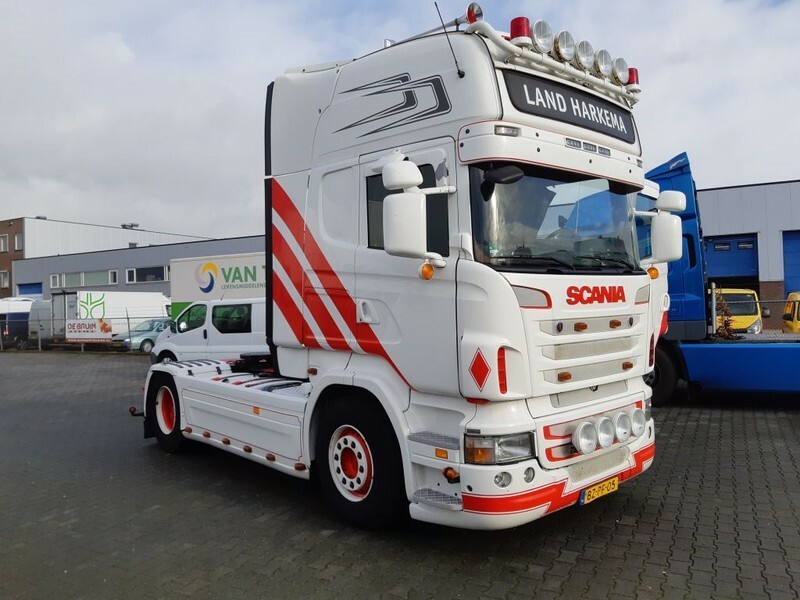 Buy Scania R 420 Topline tractor unit by De Bruin Trading B.V. Check the technical data of the unit, picked out from the catalog of SCANIA R 420 tractor unit. The gross weight is 18600 kg. Engine/driveline: Euro 5, displacement: 11705 cc, engine cylinders: 6, gearbox: automatic, transmission: Automatikgetriebe. The details on axles, suspension and euro norm include: 4x2, number of axles: 2, steering axles, wheel base: 3700 mm, ABS, chassis side skirts. Driving cab specifics: cab type: sleeper cab, cab model: Topline, roof spoiler, fog lights, sunvisor, power windows, electric mirrors, central lock, air conditioner, parking heater, cruise control, radio, CD, fridge. The mileage is 1111111 km.